The Doctor's Consultation: And a pox on your chickens! With Bird Flu from chickens being the medical press buzz words at present, I felt that this week we should review another chicken disease. Chicken pox! Of course, chicken pox (AKA Varicella) is not really caused by chickens, nor even carried by them. Chicken pox is a common disease caused by the varicella zoster virus which is a member of the herpes virus family. It is very contagious and all communities experience epidemics. A couple of years back there was a real outbreak in Thailand, with 22,833 patients with the complaint between January and May. This nasty condition never actually leaves the community, lying quiet for a while and then attacking in epidemic proportions. Make no mistake about this one, it is a most aggressive disease that sweeps through schools and institutions and while generally a disease of children, it can attack adults too with devastating results. If the temperature is raised (more than 37.5) then a little paracetamol will help (but not aspirin as this drug should not be used with children), and if there is the “super-infection” by a bacterium it will be necessary for your doctor to prescribe an appropriate antibiotic. The other important duty that you have as a parent is do not send little Johnny back to school until the very last vesicle has dried up. This is generally around a week to ten days, but is so important in trying to stop the epidemic. Everyone else seems to be having their say about double pricing in Thailand, so let me have mine, please. I know that the readers letters section is where most of the complaints go, but I think there is more sense in your column than in many of the others. People at least read your stuff, Petal! We all know that double pricing exists all over Thailand, from national parks, baht busses, tourist attractions etc, and it doesn’t happen in the UK, but since the tourist can afford it, and it is still cheaper than similar attractions, or taxis in his home town, what’s the beef? For sure the local Thai people can’t afford the higher price, so that’s why there has to be two scales of charges. What do you think, Hillary? Am I right or not? Or is this too simple for people to cotton onto? You have sort of got it right, my Petal. Thai wages are such that many Thai families could not afford to get into some of Thailand’s spectacular attractions like the glitzy transvestite shows, for example, if they had to pay the tourist price. Where everyone has got it wrong is this thinking that the tourists are having to pay double. They don’t. Look at it this way, for a moment. The tourists are actually paying the “standard” price, whilst the Thais are enjoying a 50 percent discount. I think that if the price structure were plainly stated as that, nobody would object. Having said that, I am in complete disagreement with the sneaky way used by some entrepreneurs to advertise their “Thai” prices by using Thai numbers, hoping that the foreigners cannot understand the notice. A little honesty would quickly defuse the situation, and the resultant anger, brought on by “double” pricing. I do not believe that you can use the same principle that Thais when they travel to the UK for example, pay the same “standard” price as the locals, therefore visitors here should pay the same as locals. Thais who travel to the UK are not the Thais who go to national parks here with their children for the weekend. Those Thais could never afford an overseas trip, like the foreign tourists who come here. You really must take care when accepting gifts of chocolate and champagne from Antipodean types. A “decent bubbly” will probably be a well shaken ice-cold tinny and a box of soft-centres may have been gathered from the rear end of a koala! I am so glad to see that the medications must have started to kick in, and you have recovered your powers of rational thought, and in English too! What a bonus, my Petal. However, I do think you have to be careful when you (especially you) point the finger at anyone. Your concept of a “decent bubbly” which you dropped off was Californian “champagne” and was called “extra dry” with a warning on the label that it contains “Sulfites”. This is hardly a bottle of Krug or Veuve Cliquot, is it now? Your box of ‘soft centers’ was a 10 baht packet of Rocklets. Choclatey enough, but hardly soft centers, are they? I have never tried koala droppings as you apparently have, so cannot comment on the Rocklet versus koala poo comparison. It is quite a while since I last contacted you. In fact I think it was when I dropped off your Champagne and Belgium chocs. A lot has happened since then; I have bought a house in Thailand, and a car. I gave up looking for an honest car dealer as when I returned to a couple of dealers to look over a car I fancied, to find they had disappeared, no cars just an empty lot. I landed up buying one from an English guy who was selling up and going home. I hope you did not get too wet over the Songkran period. Thank you again for the champers and chocs. You are really a proper gentleman, and I’m sorry that a nice man such as yourself had a needless problem buying a car here. Mind you, it is the same all over the world. Used car salesmen do not enjoy a reputation for honest dealing, do they. Yes, I stayed dry over Songkran, other than on the last day, when I went out and got white pasted and wet with the rest of my street. Being based in the outlying suburbs, we were spared the loutish and aggressive behavior exhibited by many of the tourists in the touristy areas. Accidents and injuries result from much of this and it is all so inappropriate to use Songkran as the excuse. It was always a peaceful festival. Your other query (not printed because of space problems) I have referred directly to the man in charge, as I know nothing, or even slightly less about electronic media transmissions. That’s why I drive an automatic car, Petal. I am glad you are enjoying life over here. Camera Class: Help! I’ve been framed! Imagine if you had one or more of your photographs framed and hanging in an art gallery somewhere. You would probably think you had “made it” as a photographer, and could sit back with justifiable pride. However, you do not need to have your work accepted by some exclusive gallery somewhere to get that warm inner glow. You can do the same from the comfort of your lounge room. There is a certain type of photo which is suitable for framing and hanging and I like to call these kinds of photographs “wall art”. This is something any photographer can achieve, without any special equipment or even special training (other than reading this article, I suppose). The secret is in thinking color as well as the subject, taking your time to compose and then sitting back and letting your local photo-shop do the rest. Here’s how. This photo was taken of a Halloween pumpkin that was sitting on the bar at a pub. 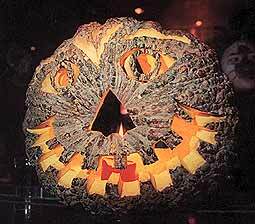 By getting up close, the candle light of the pumpkin was enough for the photo, so the flash was not used, which in turn gives it that predominantly orange color. The end result is an eye-catching orange object on a black background. There is a red candle in there too, but orange is what hits the eye. Since the object of the exercise is to end up with a photograph you can hang on the wall, get as close as possible to the subject – make it fill the frame! The pumpkin almost does that, doesn’t it? However, make sure that you are not too close for the camera to be able to focus. With compact point and shooters you may have to do some rough estimations of how close you really are. With SLR’s you can directly see if you are in focus. It is always safer to be a little further away, but still in focus, than too close and ‘soft’ and blurred. The secret is to very much decide just what is the ‘hero’ in the image and get close enough to ensure the ‘hero’ is not swamped with annoying and distracting other details. The next job for the budding wall artist is to select the best image (be that print or digital, it makes no difference) and return to your local friendly photoshop and ask for an enlargement. While 10x8 (inches) is easily done, called an 8R in the trade, for wall art I think you should look at 11x14 or even larger, if the image is sharp enough. Size does matter, don’t let them tell you anything different! With the larger prints you will have to wait a couple of days to get the print back. Remember too that is you have not been able to get close enough at the time of capturing the image, you can get the photoshop to crop, to make the central image dominant. However, you will lose some sharpness by this method. Now there is the (not so) simple matter of the frame. Do not fall into the trap of trying to make your art look larger and more imposing by having a larger frame. All this does is take away from the subject matter. Those awful gold, ornate frames are definitely the worst. Go into any of the art galleries around and see what the artists have done. The vast majority will display their work in very simple frames (or even no frame at all, just the canvas). Since the photo I have chosen here is orange on black, I would frame this with a narrow orange matte and a thin black frame around it. In this way you are accentuating the orange on black of the image. Great wall art! Adequate and proper exercise is as necessary for our dogs’ and cats’ well-being as is food and water. Through exercise, muscles develop, being extremely important for a strong support of the skeleton, toxins will be removed from all tissues in the body more rapidly as they become more oxygenated, the digestive system glands secrete their fluids better, and the bowels move more easily. And as mental needs will be fulfilled, the animal is less likely to develop problem behavior due to boredom, such as excessive barking, destructive behavior (e.g. digging or chewing), or compulsive behavior (e.g. self-mutilation by excessive grooming or licking or tail chasing). In other words, regular exercise helps preventing physical as well as mental diseases. Therefore, it’s important that the animal can put its energy in activities like play, walking, (free) running and/or swimming. Swimming strengthens the body in the same way as running and is highly recommended for dogs with hip and joint problems. Cats love to chase moving objects. Free roaming cats will find plenty of exercise outside their homes. For healthy full-grown dogs, at least 30 minutes (two times 15 minutes) a day of aerobic exercise is necessary, whether that’s play with other dogs or with their owner. Playing with other dogs does not only stimulate physically and mentally, it’s also enormously benefits the communication skills of the animal. Popular games to play with the dog are fetch, retrieve, search and tug-of-war games. On leash walks build a bond between owner and dog, it can build manners and it gives some physical and mental stimulation. Free running builds stamina, strength and gives lots of mental stimulation. Jogging or running with the bicycle builds stamina though gives hardly any mental stimulation, resulting in a dog that needs more and more exercise before it gets tired. Mental stimulation, such as search games, is more tiring to a dog than physical exercise. Another downside of dogs accompanying a jogger or bicycle rider is that when running at one speed they can easily over-strain themselves owing a potential for concussive damage to bones and joints. Often they won’t indicate when their point of exhaustion has been reached but keep on following their owner. Growing puppies are even more susceptible to serious injuries to bones and joints by improper activity. Therefore, puppies should not be expected to exercise rigorously until they are approximately one year for small dogs and one and a half years for big dogs. Jumping over obstacles or when catching a ball or other object can tear ligaments, damage joints or backs, as puppies don’t have yet the strength and coordination of an adult dog. Exercise on soft surfaces is preferred over hard surfaces, and tiles or other slippery surfaces as play grounds are considered no-no’s. Short to moderate leash walk, fetch games where the ball rolls over the ground, search games or play with other same-sized puppies are ideal. For more information on pets health, dog and cat boarding, dog training and behavior please visit www.luckydogs.info or contact LuckyDogs: 09 99 78 146. Considering that people depend on commodities every day of the week it is somewhat surprising that so few actually invest in them. Whilst most will contemplate putting money into equities and property hardly anyone will think about foodstuffs, metals, energy products or things for making clothes – basically everything you need to survive on this planet. Long term readers of this column will know that we have been bullish on commodities, and especially gold, for quite a while now. Every so often though, commodities force their way to the fore. When raw materials are in great demand and supplies are not what they should or could be then prices go up through the roof. As anyone who takes a look at the Financial Times commodity page can see, commodities have done rather well over recent times and it is safe to say that the bull market is going to be with us for quite a while. The really good news is that when a commodity bull market appears then it is with us for quite a while. Over the last two hundred years there have been five bull markets, the shortest of which lasted fifteen years. This one, if you look at when commodities last bottomed out, started in 2001. Just out of interest, the longest one continued for over 40 years. So, whilst it may be tempting to cut back on exposure to commodities the opposite is true. Joanne Baynham, the head of fundamental research at Miton Optimal says that the commodity “cycle has still much further to go”. The reason that commodity bull markets last much longer than those driven by direct money is the old A-Level Economics conundrum of supply and demand. When demand is on the up then supply lags behind because there has been no recent investment in research, maintenance or purchasing new equipment. It takes years for supply to catch up as it cannot be increased overnight. Taking up Joanne again, she stated in a recent article that “investors will increasingly shift their focus on the supply side of the equation in 2006”. We would definitely expect to see a surge in merger & acquisition activity as the big miners buy out smaller exploration companies. This is a good short term answer but does not solve the longer term fundamentals whereby the fact is that there are only a finite number of smaller companies out there and someone, sometime soon is going to have to bite the bullet and invest in exploration themselves. But the important thing here is that the longer they hold out for short term profit and ignore long term gains then the longer the commodity cycle will go on. Also, the mining companies have to look at the short term returns for their own shareholders. BHP Billiton has gone on record and said, “Industry wide, the supply side response to continued strong global demand for new materials remains constrained by a shortage of people, equipment and supplies.” This has led to tight labour markets and difficulty in sourcing construction and drilling plant and machinery, which in turn has led to rising input costs. Credit Suisse First Boston states that to justify a return in investment on a new copper mine, the long term copper price needs to be around USD1.50 per pound compared with current industry thinking of USD0.90 per pound. There is a similar thinking for nickel, zinc and platinum. However, despite all of this, people need all of the above in ever greater quantities at the moment and this is why they will do more than hold their own in the markets over the next few years, especially when companies like Caterpillar come out and say in the Financial Times, “mining equipment is sold out through 2007 and that the cycle has legs and looks stronger than the upturns in the 1980’s and 1990’s”. Currency strength against the US Dollar is also adding further pressure. With the onset of a weak US Dollar in 2002, commodity currencies began to grow stronger and strengthened even more when physical commodity prices started to go up in 2004. Currencies such as the Rand, Chilean Peso and Australian Dollar have appreciated by between 25% and 50% since 2002. We can also look at oil. Just think that one billion people live in the developed world and, out of the remaining five billion, over two billion live in two countries – India and China. These two nations are playing catch up with the West and need as many commodities as they can get their hands on – especially oil. However, the problem here lies in two factors. Firstly, there are not enough refineries in the world to process what we are producing at the moment. Even when there are, then the demand curve will have increased even more. Also, the lack of development in new large oil fields has been very obvious over since the early 1980s. This means that even if one is found tomorrow then it will take years to get everything necessary in place. So, unless there is a large investment in the basic infrastructure of oil and all that goes with it then the world will be continuing to play catch up for many years to come. I ate a worm for charity. One. Small. Fried. Grey. If there is indeed a taste for the color grey, it tasted grey. (I’m not really sure how it tasted since I downed it as fast as possible while trying to imagine there wasn’t a worm on my tongue and then drank several beers to forget the entire event.) It needed more garlic. At least 15 cloves, a wok full of vegetables, a vat of rice and a thick layer of chili sauce, which is the way you eat worms everyday when you don’t know they’re there. Three darts cost 100 baht = $2.50. Missing the bulls-eye, I had to choose Door Number One, Two or Three: eat a fried worm, grasshopper or chicken foot. The grasshopper had long brittle legs, crispy wings and fried eyes. Door Number Two was locked and bolted. I’d watched other losers stuffing chicken feet in their mouths, trying to chew the rubber between the toes while trying not to be scratched in the gums by the toenails as I pictured the Formerly Alive And Walking Foot squishing through chicken poop, marinating itself with mutating strains of Asian bird flu. Door Number Three led to the Vomitarium. Door Number Worm had no face or feet and required no chewing, only swallowing. I don’t remember what I’d have won with a bulls-eye. Perhaps an actual fried bulls-eye? 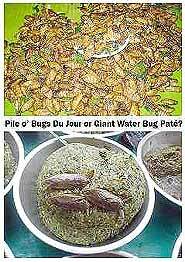 Maybe a seven-course meal at a lavish Bug Buffet laden with mole or house crickets, termites, blackened scorpions, giant water bug pat่, grasshoppers the size of mice, baby bee omelets, fresh red ant eggs to sprinkle on your salad, plus worms of every shape, size and sexual preference? So why are shrimp and lobster delectable? They’re insects’ kissing cousins with a bunch more legs. Do we think they’re clean and sweet because they’re constantly bathing in the sea compared to filthy bugs digging in the dirt? During grade school in America, I had a clear plastic ant farm. Their ANTics enchANTed me for hours: washing themselves, each other and their eggs, standing around beads of water with tiny towels, bars of soap and underleg deodorANT. I ordered the chocolate-covered ants advertised in the back of a comic book. If you didn’t read the wrapper, you’d have thought it was a Crunch Bar, which you know in your heart contains other crunchy things besides rice. We ate a bit but saved most of it to terrorize girls on the playground. I have since become an anteater in Asia, intentionally and unintentionally. Engrossed in a book while relaxing on the guest house deck over a jungle river, I take a swig from my Coke can on the table. Ahh, the carbonated fizz is refreshing, like ants dancing on my tongue. AAURGH!!! ANTS ARE DANCING ON MY TONGUE!!!! They’re all over my hand and already down the hatch! Hopefully they won’t build a farm in my stomach. Intentionally? A whole barbequed chicken from the market waits in the microwave in my outdoor kitchen, not freezing in the fridge, not attracting critters on the counter. The sun sets. I’m starving. The chicken is served. It’s swarming with ants. Okay, fine. I’m too tired to be American, but it’s not too late to be Asian. I scrape it off, microwave the Antsy Poulet Du Jour, turn out the lights, dine in the dark and pretend it’s battered, not bANTered. I doubt if there’s anything that was once alive that isn’t eaten in Asia. Don’t complain in a restaurant if you find a cockroach in your food. You’ll probably just be charged extra. Stepping off a bus in Laos, a friend was proffered a platter stacked with deep fried tarantulas. Very large with hairy legs, all organs and genitalia intact. Crunchy on the outside with a warm, chewy center. Mmm, fried spider hair to tickle your taste buds.